not the most inspiring spoons in the country,pretty small and cramped and very busy for a wed lunchtime,two people serving but clearly overworked as with most spoons these days,most of the ales were "coming soon" which could mean either coming soon or gone it would seem,the pint of titanic i had was very nice mind,6/10 heading over road to the Greene King place next but from what i have read on here not sure its the best plan in the world! This pub is actually in the town of Matlock, but listed as the town of 'Crown Square' (I have pointed this out to admin). Surprisingly good beer for a JDW, and nice food. A bit grubby though. 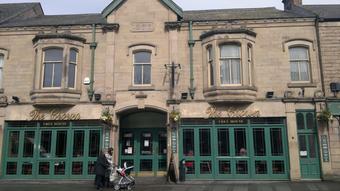 A good example of a decent Wetherspoon pub. Lots of good quality real ales, many of them from local micro breweries, including several from Thornbridge when I was there. Even the service at the bar was good, which is not always the case with this chain. Great pub for ale. There was a large selection of interesting, mostly local beers and the Jaipur I had was in fantastic condition. We also had food, which was ok, typical JD stuff. Staff were nice but it was a bit irritating that the baby-changing facilities are only available if you get the staffs attention so they can let you in. If there is a queue at the bar it gets a bit frustrating.